Makerbot Patents twist the knife on open source 3D Printing roots, community responds. Something is leaving a bad smell in the Open source community, could it be the recent Patents of big cheese Bre at Makerbot. It's always very sad when you see a company or group turn their back on whatever community or project that helped make them successful. Makerbot seem to be traveling down a darker and darker road as time goes on. I'm not sure if they felt invincible or that no one would notice but a recent patent frenzy by Makerbot has angered the open source 3D printing community. And we don't yet know what more is to come. I prefer to use this blog to document work and talk about good things, so this is really a summary of past and recent events and links for you to find out more and make your own mind up about Makerbot's actions and community reaction to these disappointing and Machiavellian maneuvers. And before we go on, I am not against Patents, they can be used for good to protect ideas and costly investments into research, that for some is a necessity to fuel sales and marketing of a product or invention. I don't think they are very fair and certainly not appropriate in many (most) cases, but they are not going away any time soon. For this trade off of hard work you can exploit an idea under a patent for a set period whilst also disclosing information about the invention and use. Yes, RepRap and many open-source developments were built on expired patents. That's how it's supposed to work. A company gets 25 years to exploit it's patented invention, if after that time the market demand is still there and competitors can build a better mouse trap, then competition usually kick-starts another industry cycle and one could argue the original patented idea was not exploited well enough or the market was not satisfied with just one source of mouse trap. What angers individuals is when ideas and developments that were in the public domain, very often with a specific open-source license are taken and patented by a company so others automatically now infringe. (or could be accused to infringe). Patent trolling or this is abuse of the patent system is about as insulting as you can get to a community that encourages open innovation and sharing of open source developments. Companies that can afford to mop-up open innovation into hundreds of patents, loosely based on ideas common in an industry or sector often have the power to legally threaten anyone that becomes a competitor. Using this abuse of the patent system can tie up smaller companies and stop new developments from even starting due to this sword of damocles handing over head. Many things are just not worth patenting for companies or individuals, due to the cost and return possible along with the ability to be able to defend your patent if required. But if these seemingly insignificant ideas are patented by bigger companies who can afford the process, as a way to expand their patent portfolio, even if they were not 'invented' they take on another form of power. Makerbot did 'invent' and patent an automated build platform, this was a commercial failure and proves the point not all ideas are worth patenting. 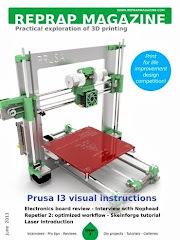 Also the idea of an automatic build platform was openly discussed by various people when I first joined RepRap, long before the Makerbot patent, the difference here being that no one found it useful, practical or in any way essential, so the news Makerbot patented it was just not such of an issue. 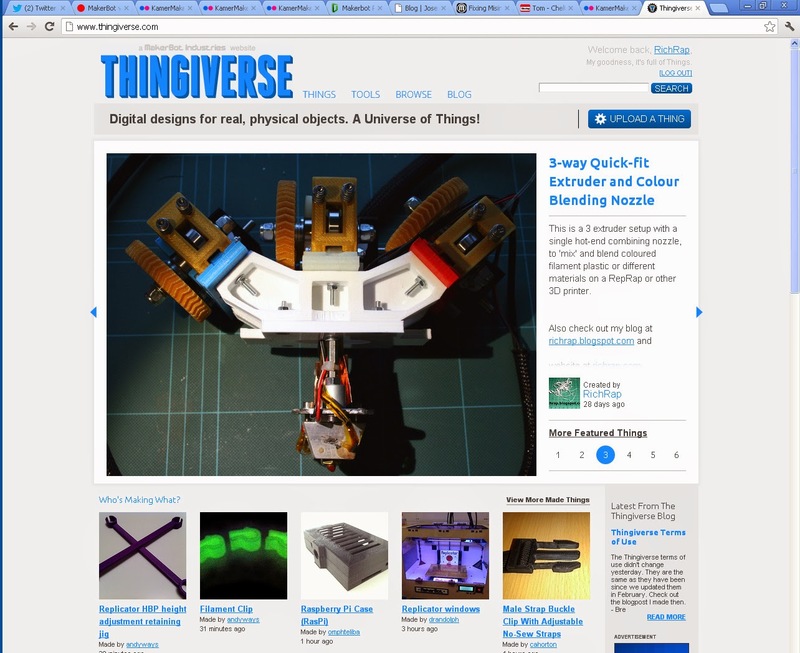 Back in September 2012 changes to the Thingiverse Terms of Service along with various concerns that Makerbot was moving away from it's RepRap and Opensource roots led to an Occupy Thingiverse campaign. And the very next day after on the 21st September 2012 they filed a patent for build material switching. Along with my 3-way multi-input material extruder above, I also posted, documented and shared my simple solution using lengths of different materials to produce multi-coloured objects - that was back in June2011. Makerbot want to patent various things to do with multicolour and multi-matrial mixing, much of which has been done and documented in the open source community (Even directly at Bath University - UK as early as Feb 2012 and mentioned on the RepRap Blog June 2012 - Myles corbett report) This, over the last few years and is a very active area of open-source 3D printer development for myself and many others. Abstract - A three-dimensional printer uses transitional lengths of build material to facilitate changes from one color to another during a fabrication process, and more generally to achieve multi-color objects corresponding to color patterns on the surface of a three-dimensional model. The transitional lengths of build material may be positioned inside a fabricated object, such as for infill, or outside the fabricated object where undesirable aesthetic properties of the transitional lengths will not impact the desired distribution of colors on the surface of the fabricated object. Abstract - By reversing the direction of a first build material fed into an extruder, the first build material can be wholly or partially evacuated from the extruder before a second material is introduced. This approach mitigates transition artifacts and permits faster, more complete changes from one build material to another. This also contains the details of how you can file a prior art application to help block a patent that is based on someone else's work or in the public domain. Visual guide graphics below courtesy of Anthony Clark. If you are now looking for a place to share, YouMagine is a very good starting point. GitHub is also an option, and a simple method to export all your things from Thingiverse uses a simple Python script by Carlos García Saura - Look Here for info. Repables is also looking good for content sharing, and is being further developed right now. Ultimately work like the Thing Tracker Network, by Gary Hodgson may make it easier to link and share designs and models from almost any source, so don't stop sharing and keep it open source. If you see any other coverage on the Makerbot Patents, post links below. Thanks. The 3D Printing Filament spool standard campaign is still going well, updates soon. E3D Just released the V6 hot-end -I have had one for a while - it's amazing !